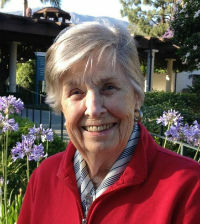 Margaret Mary (‘Peaches’) Simpson Clarke died peacefully on May 10, 2015 in Santa Barbara, CA. Born and raised in Tacoma, Washington, Peaches graduated from Stadium High School. She attended the University of Washington for two years, where she joined Kappa Alpha Theta sorority. She met ‘that cute Herbie Clarke’ while in high school. They married in 1941, living in many places that included Bellevue, WA, Stamford, CT, and Los Angeles, CA, before settling in Santa Barbara in 1970. The matriarch of five generations, Peaches’ greatest delight and joy was her family. She deeply loved and was so very proud of her eight daughters and each and every member of their families. Exceptionally warm and welcoming, her home was filled with family and friends: others’ kids who considered her ‘Mom’, and strangers who were quickly made to feel like family. There was always room for one more at her table. Peaches loved people of all ages but babies were her specialty. Often, Peaches was the most elegant woman in the room and, at the same time, the silliest. She loved a good story, a ribald joke and dissolved into laughter whenever possible. Long holding a love of travel and adventure, Peaches drank in the views, the people, and the experiences. She considered chocolate an essential food group, always maintaining a secret stash. Peaches loved music and sang tenor with various choirs and will be especially remembered for her deep, rich voice. Peaches is survived by daughters Merrill Hunn of Mill Valley, CA; Elizabeth Lashar (Rick) of Eugene, OR; Anne Dennis (Mickey) of Marysville, WA; Kathryn Clarke (Peter); Patricia Clarke; Susan Clarke (Rand); Virginia Clarke; and Laura Murphy (Michael) all of Santa Barbara. She was dearly loved and will be missed by her 17 grandchildren, 21 great-grandchildren and 4 great-great-grandchildren. She is also survived by her brother James Simpson (Rosemary), sister-in-law Yvonne Simpson, all of Seattle, WA, and sister-in-law Marion Berge (Bill) of Snohomish, WA, as well as her many loving nieces and nephews from both the Simpson and Clarke clans. She was preceded in death by her husband Herbert H. Clarke, Jr., parents John Philip Simpson, Sr. and Hazel Pohl Simpson, son-in-law, Richard A. Lashar, and great-grandson Sullivan Clarke Rich. A celebration of her life will be held Sunday, July 19 at 3 pm at El Montecito Presbyterian Church in Montecito, CA. There will be a reception immediately following at the church. In lieu of flowers, the family requests that donations be made to Smile Train (http://www.smiletrain.org); Doctors without Borders (http://www.doctorswithoutborders.org); or Visiting Nurse and Hospice Care of Santa Barbara (http://www.vnhcsb.org).